RhodeCode provides a powerful, unified management interface for Git, SVN, and Mercurial. Pick the repository type depending on your project, not on your code management tool. 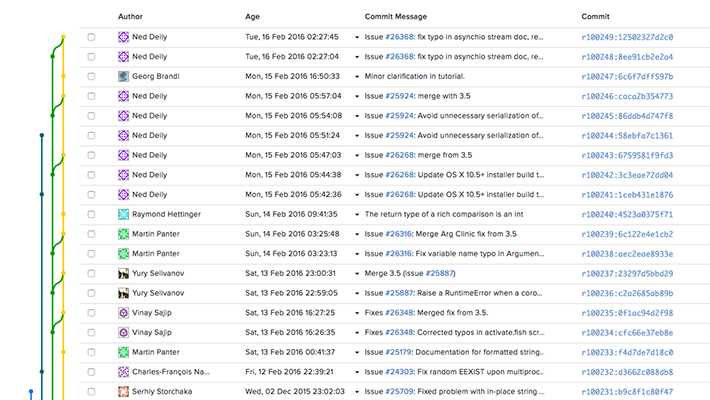 Read and write in all repository types from one central point, and see commits, forks, and changeset merges at a glance. By consolidating your tool set, you improve overall awareness and knowledge sharing and reduce the cost and time of retraining. If you are DevOps or an Admin, you'll love us. We have a slick, purpose built installer called RhodeCode Control. It is specifically designed to make installing and upgrading RhodeCode as smooth and easy as possible. You can instantly install, manage and control instances. Our system is inside a sandbox from your operating system. This means OS System library upgrades doesn't affect it. 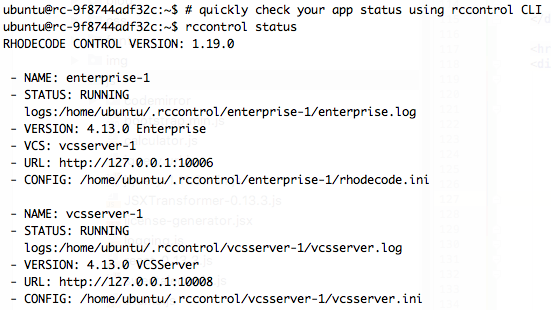 Rccontrol works on any Linux, in addition it's compatible with system upgrades, so you don't have to re-install it when you upgrade your operating system to next major release. To guide you, it comes with a whole set of online docs, too. Large scale projects quickly outgrow boundaries, and searching for code snippets becomes time-consuming. Quickly search for matching results in repositories, comments, gists, and files within RhodeCode and get instant access to what you are looking for. Repositories can be set as being "world-open", which works best for open source projects, "organization-open" for company-wide documents, or "invite-only" for the most restricted access to files. In addition to HTTP[S], there's an optional support for SSH protocol so you can send and receive data using passwordless authentication. Easily browse, create, delete, and edit files directly within the RhodeCode web interface. With syntax support to most of the languages, easily re-format or fix and small issues right from the web interface without opening your editor. Keeping track of changes in a development team can be tough and time consuming. The graphlog and changelog displays let developers see the progress of a project at a glance, removing the need for interruptions. Easily track progress and updates with the changelog. The additional graphical log visualizes heads and merges in an intuitive way. Add videos, images and other important assets to your repository to keep them safe and sound. RhodeCode supports large binary files for Git, SVN and Mercurial. Including Git LFS or Mercurial Largefiles extensions that wour out of the box.